Visibility can be an important property, one that represents status, legitimacy, rights, privileges, and powers. If you don’t think so, ask the women who have been Invisible Wives at corporate dinners, or the men and women who are still trapped in the closet, or the street people who are treated as if they don’t exist, or the elderly who have to endure others talking about them as if they were in another room. Consider also what it can mean for an ethic group when one of their own achieves celebrity, or when they can see themselves as they are in entertainment and advertisements, or when strangers nod pleasantly as they pass by in the office or at a restaurant. Sure, the very rich prize not being seen by the masses, but they already have what they need otherwise and are assured plenty of recognition and deference within their own circles of entitlement. For most of us, however, it’s a good thing to be visible: more specifically, to be seen without social stigma or stereotype and as if we belong in the picture. Which is why the problem of Native American invisibility continues to be part of that prolonged catastrophe that otherwise is known as their history. This invisibility is not for want of paintings and photographs; in fact, they are part of the problem. Can you think of an image of a Native American that is not of a primitive warrior, or rural poverty, or a casino? Photographers return to the reservations and urban ghettos, but no matter how hard they try, it seems that the mix of persistent social problems and ritual trappings will defeat any attempt to see anew. And in any case, this may be a prime example of how, as Errol Morris has reminded us, believing is seeing: the stereotypes are likely to dominate perception no matter what else is intended. And because of their geographic isolation and how that compounds dysfunction while reducing assimilation, the native peoples of the Great Plains may be in for the worst of it. This week Time put up a slide show by Aaron Huey centered on the Pine Ridge reservation in South Dakota. Aaron has put years of work into gaining the trust of the Oglala Lakota people living there, and he is trying to break through the wall of invisibility that prevents any understanding of both the “failures of the reservation system” and how, for all that, people are finding ways to care for one another, preserve their shattered culture, and perhaps even one day receive justice. I won’t presume to speak for the photographer, but the show is provided to prompt discussion. I find the image above to be incredibly reverberant, and the news is not all good. Once again, no one is in the picture; once again, the West can be imagined as both unpopulated and awaiting European civilization. Once again, Native American culture appears almost immaterial, ephemeral, a collection of feathers, scraps of fabric, and other ornamental flotsam that will be carried away by the next big wind. But that’s only part of the tableau, for European culture doesn’t come off any better. That neoclassical monument was never an award winner and it’s gained nothing with the passage of time, but above all it was out of place from the start. What would simply be overlooked (invisible) in today’s urban park here looks ridiculous; worse, it can stand for all that did not follow, the promises of settlement and development that never came to pass. Instead of another city of the prairie, we have instead only the fence, and with that the political fact of forced enclosure. That fence is too banal to really qualify as a symbol, but it will have to do: like the reservation system itself, it’s a cheap but effective barrier, and one that–like the monument–was out of place from the start. So it is that another roadside memorial tells a story, but not the one that was intended. Nor is that the whole story, for there is one more thing: that impossible sky. Thus the photo provides myth and reality: the sad, forgotten memorial, itself a hodgepodge of two cultures that tragically collided, and its backdrop of sublime natural beauty with all the spiritual power and promise that still holds. To live under that sky is still to be impossibly rich, unless of course you are impossibly poor, sick, abandoned, and traumatized. There are a few white settlers still living under that sky, and some of them can still see it, but for most of us on all sides, that experience has been lost to either catastrophe or affluence. It’s odd that the sky could become invisible, but that, too, is part of the history signified by that monument. I don’t think Aaron breaks through the barrier of Native American invisibility, but I doubt that any one documentary project could do so. What is needed as well is a change in the audience. Now that Aaron has done his part, the question remains of who will bother to see what is there. You might start by looking up, and then around you. And then? 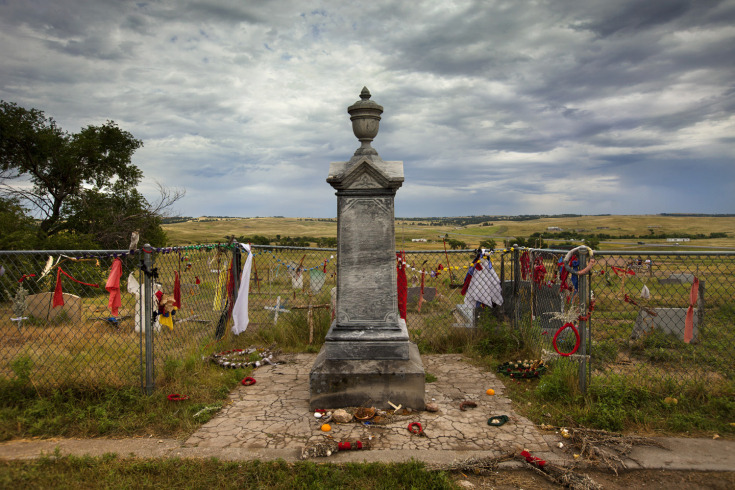 Photograph by Aaron Huey, Mass grave at the site of the 1890 Wounded Knee Massacre. The politics of invisibility are just as important as those of visibility. An observation from my Israeli/Palestinian perspective or focus: there’s a parallel between the US and Israel as ‘immigrant societies’ whose condition of possibility was the dispossession and decimation of the peoples who lived there before. In the US, that fromer presence is barely visible, yet the name places remain. In Israel, for the most part th ename places have gone, but at least the trained eye can often see the remains. Different ways of rendering invisible, yet some reminder remains.